I love making salsa and pico de gallo but let’s be honest. It takes a really long time to chop all those veggies plus the onions, peppers and cilantro usually leave a lingering smell on my hands. I still crave handmade salsa and want it to be something I can make on a whim. Thanks to Hunts Fire Roasted Diced Tomatoes with Garlic, I was able to make a really tasty, quick salsa that didn’t require me to chop or slice a thing. Plus, it’s all ingredients you can keep in your pantry until it’s time to make that no chop salsa. If I were chopping everything, these are the tools I would need. 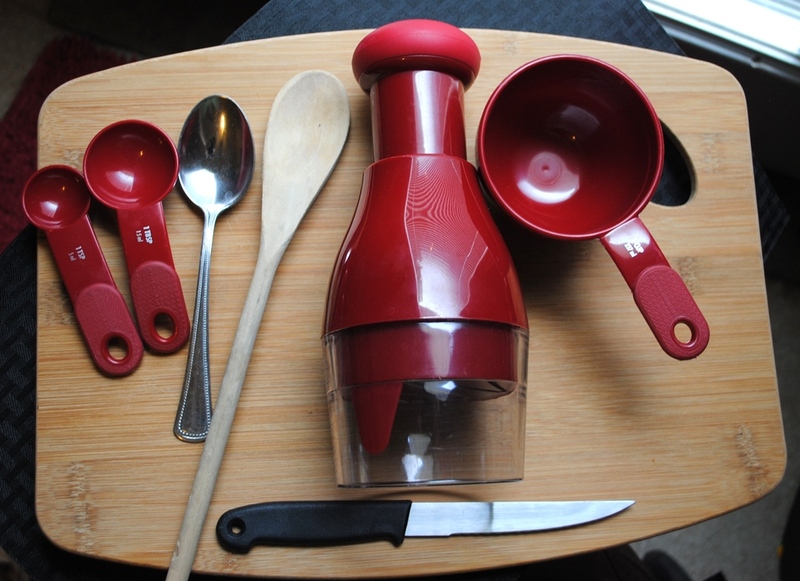 With this no-chop salsa recipe, these are all the tools I needed. 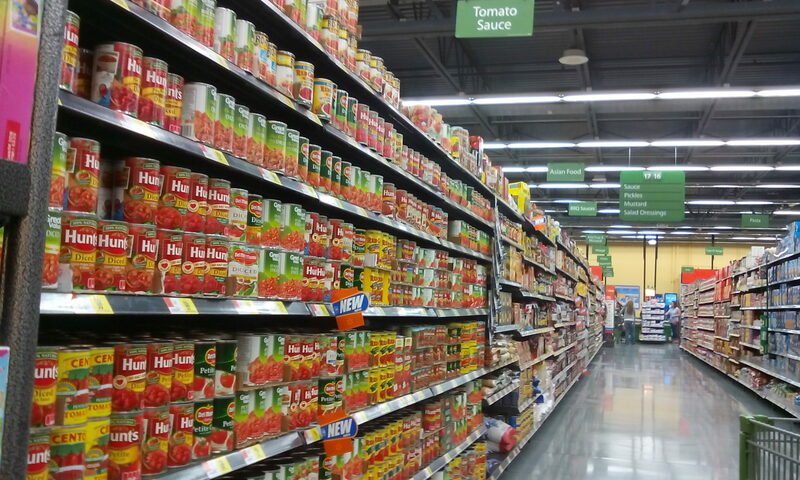 Usually most homemade salsa ingredients are in the same basic place at Walmart but when you purchase items that are pantry-friendly, you will need to look in a couple different spots. 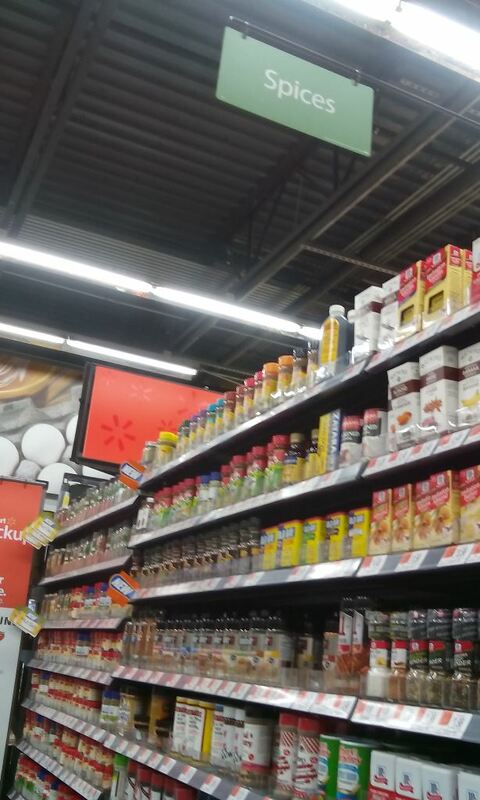 I had to go hunting a bit on my first time so I took pictures to make your life a little easier when searching for ingredients. The Hunts canned fire roasted tomatoes (get the ones with garlic) are the easiest. They are in the Tomato Sauce aisle. They have other Hunts varieties of diced tomatoes but I got the ones with garlic so I wouldn’t have to add that ingredient. The dried cilantro and the dried minced onions are both in the spice aisle. The cilantro is kind of a specialty item so it will be with the fancier spices. I’ve heard you can also use dried parsley with salsa but that doesn’t sound as flavorful to me. When getting the dried onion, get the kinds with the bigger flakes. 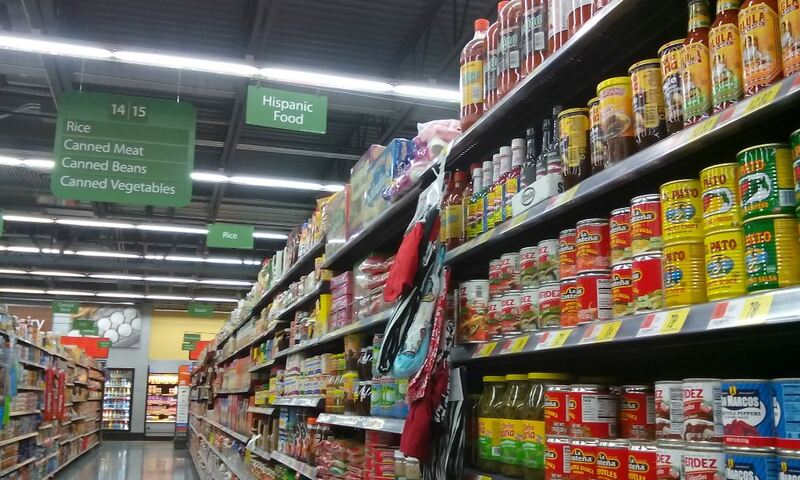 The diced jalapenos were in the general Mexican food aisle. I first grabbed the ones you use for nachos then found the diced ones in the area where you get enchilada ingredients. I got canned jalapenos but should have bought a jar so I could use a lid for the remaining peppers. 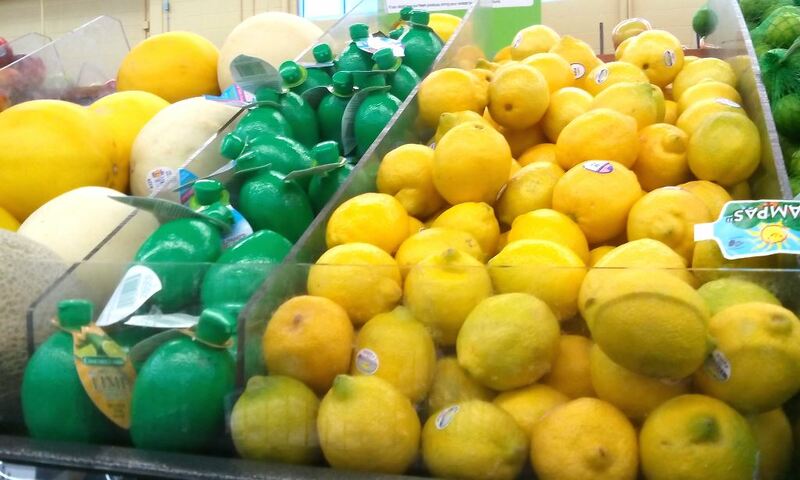 The lime juice was up front with the fruit, instead of the juice aisle like I thought (and where you get lemon juice). 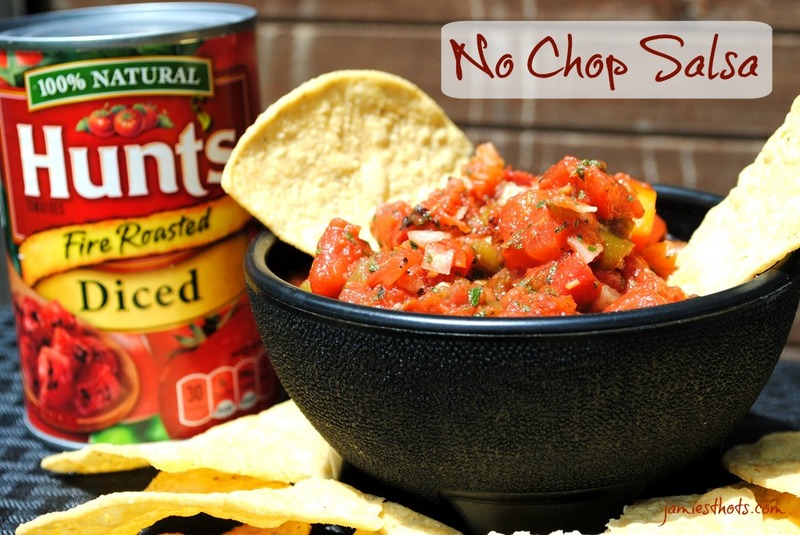 Very few ingredients are required to make this no chop salsa. Now that you’ve purchased your ingredients, let’s actually the salsa. Substitution notes: If you don’t get the fire roasted diced tomatoes with garlic, I would add about 1/8 teaspoon garlic powder. If you don’t have or don’t want cilantro, I’ve heard that dried parsley would also work. Are you ready for easy? This literally took me five minutes, maybe less. 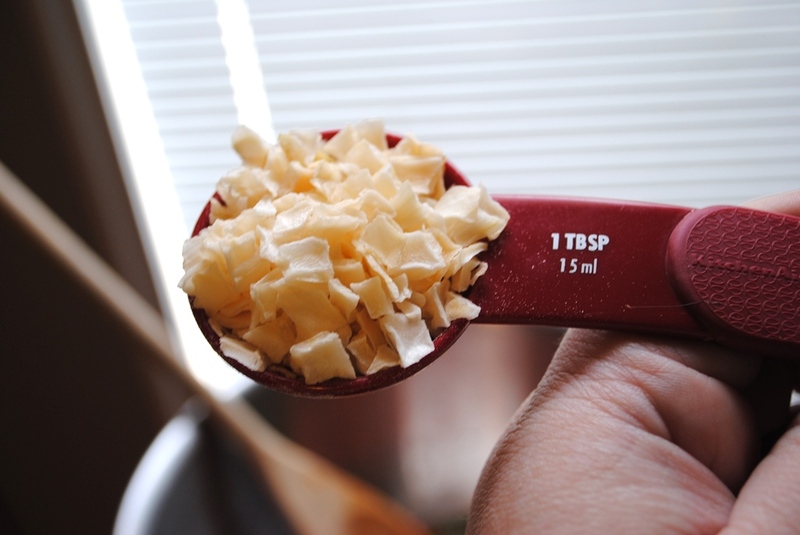 Basically, you measure out the ingredients listed above and mix them really well so that all the dried ingredients absorb some of the liquid. For maximum flavor, make it several hours ahead of time and let it sit in the fridge. Let’s see those instructions in pictures, shall we? 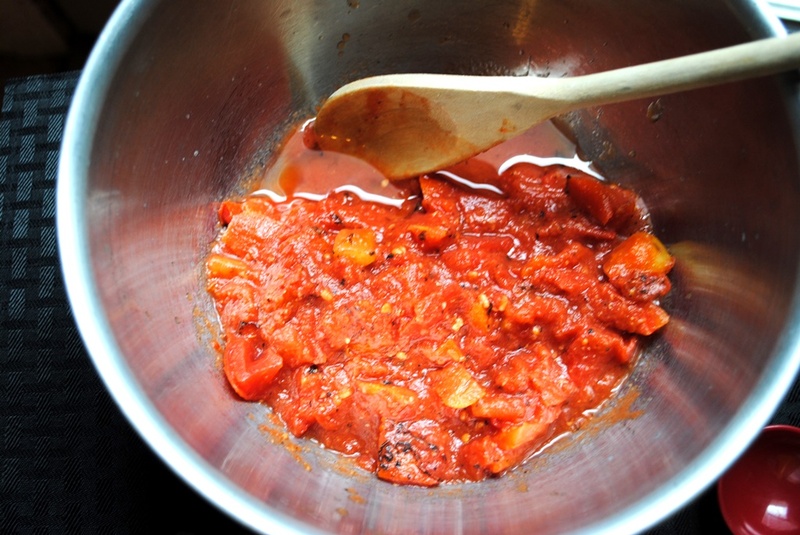 Open the can of fire roasted tomatoes and dump it in a bowl with all the juices. 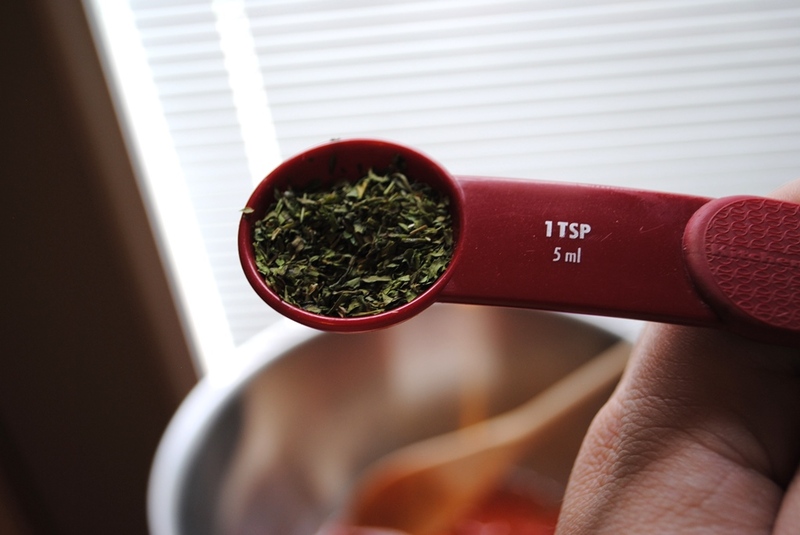 Measure out two teaspoons of the dried cilantro (when you use fresh it’s tablespoons but with the dried that would be way too strong). You need 2 teaspoons. 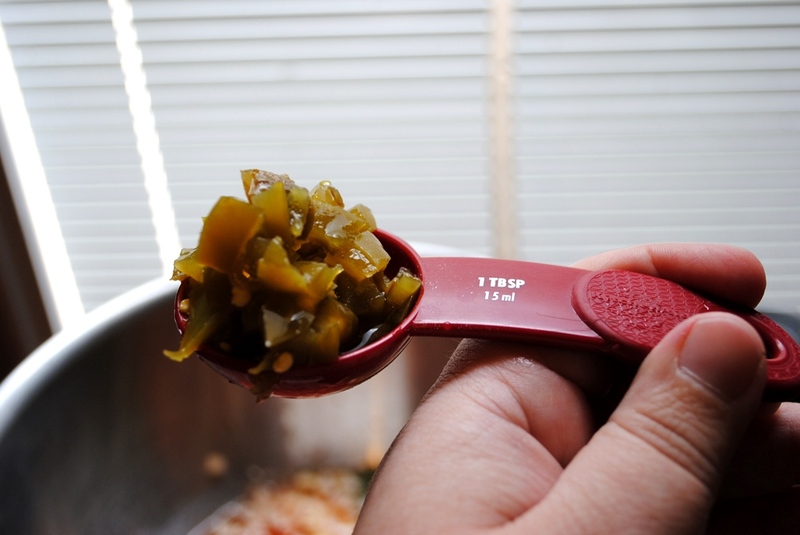 Measure out the diced jalapenos and make sure to store the rest of them safely in the fridge. You need 2 tablespoons. Check out those dried onions! Using the brands that make the bigger flakes will give you better results. You need 2 tablespoons. I forgot the lime juice the first time around and had to add it later! 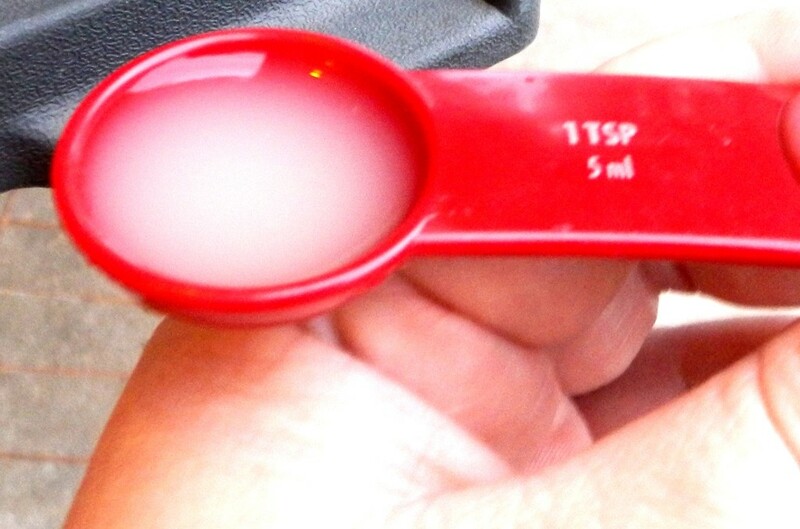 You need 1-2 teaspoons. The finished product is chunky salsa with a bit of kick. No knives or chopping utensils were involved. You can’t even tell that half the ingredients were dry just 10 minutes before this picture was taken, can you? The above recipe makes only what fits in that standard restaurant-style salsa dish so only a couple cups if that. You can easily double the recipe for large crowds. If I were doubling it I would use one regular diced tomato can and one fire-roasted so there’s not too much heat. 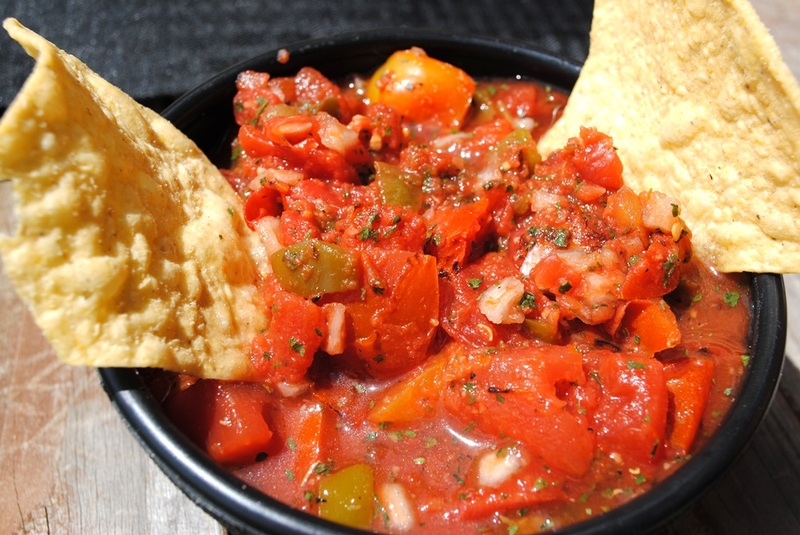 Want to find other fantastic Hunts diced tomato recipes? Check out this site with recipes from my fellow bloggers. And we’ve even made it more affordable for you to make a whole lot of salsa with this coupon from Hunts for buying the tomato products at Walmart. 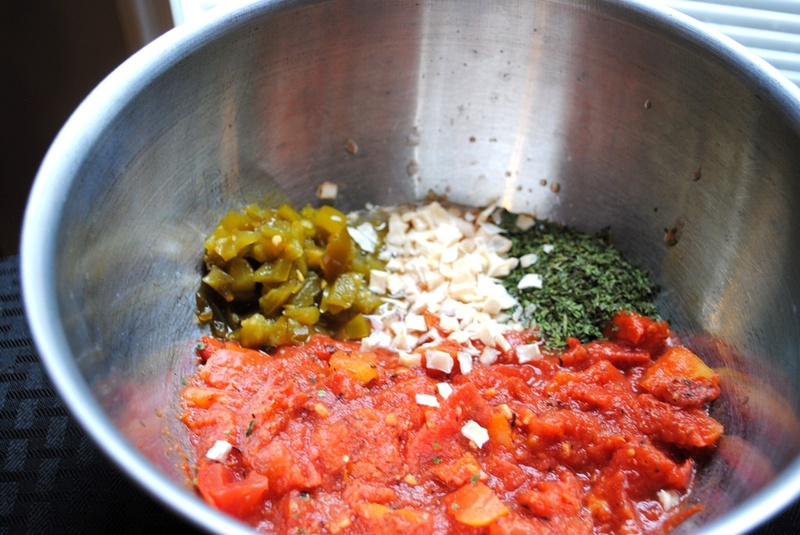 What are your favorite ingredients to put in homemade salsa? Besides chips, what do you like to put salsa with? I love it on baked potatoes and with fish.